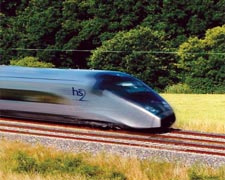 10 responses to "Against High Speed Rail"
I was pretty [sure] you’d oppose HS2 for the right reasons; a bit disappointed to see you’ve also fallen for some of the propaganda that led me to make that comment. Based on your starting point that (I’m paraphrasing, but I don’t think unfairly) to avoid a complete collapse in society, we need to cut energy consumption by 75% and move away from a system where decisions are primarily made on a market basis, HSR is obviously a terrible idea. In that context, compulsory restrictions (or heavy taxes, makes no odds to the outcome, just the distribution) on car and plane travel are feasible, and a low-speed, high-capacity public transport network is the only way of maintaining current levels of mobility at the levels of energy consumption you reckon are sustainable. That’s our fundamental disagreement, and I completely respect your point of view, and your opposition to HSR on that principle. But you’re wrong to view London-Birmingham HSR as a way of taking 30 minutes off the time to get to Birmingham. Spending GBP17 billion (not GBP32 billion, which is the expected cost of the entire English network) on that would obviously be insane, which is why nobody is proposing that we do it, and why the project has a benefit/cost ratio above 2 rather than of about 0.1. So, we’re building a new line. The question then is the speed that it runs at. It turns out that, unlike in the 1830s, the costs of building a new railway are almost unaffected by the design speed. Building something wiggly is no cheaper than building something straight, and straightness is all that HSTs require (they can take far steeper gradients than anything on the Victorian railway). In-cab signalling, although vastly expensive to add onto existing signalling systems, is no more expensive than colour light signalling for a new line that won’t have any legacy traffic. The extra cost lies only in providing higher-spec track and wires, which as you might expect is a rounding error in total project costs, and obviously in the trains themselves. This small cost variation (not the total cost of the project) *can* be justified by the time savings compared with building a slow line. The bonus here, more or less for free, is that once you’ve got this new high-speed line in place, it changes the economics of building other lines. The most obvious is a line from just north of Euston to just east of St Pancras, allowing people to travel from Birmingham to Paris, Brussels, Cologne and Amsterdam at a journey time that’s competitive with air travel. If we’re in a market-based world rather than a 75%-energy-cut world, and therefore mandatory cuts on air services aren’t happening, this is a massively good way of driving modal shift. Then, there are the other possible lines north of Birmingham. These weren’t greenlighted as part of the HS2 procedure this week, and aren’t included in the benefits of the London-Birmingham line. Rather, in a few years time, they will be evaluated as add-ons to the network, and considered on their own merits. Capacity isn’t nearly as important here (while trains in the southeast and on the mainlines out of London are as long as they can sensibly be, most trains elsewhere are 2/4/6 cars and could easily be lengthened), so this phase will be evaluated solely on the merits of faster connections, which may well mean that it never happens. Again, allowing people in Manchester and Leeds to reach Paris by train will reduce air travel; I’ve no idea whether this will be enough to justify new lines or line upgrades. Also, where did you get the idea that HSR carries far fewer passengers than conventional rail? The plan for HS2 is to run double-decker, 200m trains, like France’s existing TGV Duplex, which seats 550 people per train – pretty much the same as conventional longish-distance trains in GB. The planned number of trains per hour is 14 – higher than on most conventional lines, because everything will be moving at the same speed (for obvious reasons, speed differentials kill capacity). Thanks for the comprehensive response, John. First up: I hadn’t realised that the GBP32 billion referred to the entire network as opposed to the London-Birmingham bit. The news report I watched on TV last night didn’t make that clear and I simply misread an article online. Mea culpa. I’ll update the blog post. However, that doesn’t actually affect my basic position. I happen to think that the project is likely to come in considerably over budget; but whether it’s 32bn, 17bn or 5bn, it’s still wasteful in comparison with other options and doesn’t solve the issue raised by energy depletion; on which we disagree about the basic premise, so I won’t labour the point too much… essentially my argument is not (just) an economic one. I fundamentally disagree with you regarding coaches. Yes they are slower, but not by as much as you might think. The current London-Victoria to Birmingham Coach Station trip is about 2 and a half hours (express rather than stopping service). Give the coaches a dedicated motorway lane and start off from Brent Cross to cut out central London traffic and I feel pretty confident you could reduce it to perhaps 2 hours. Sure, that’s roughly double the HSR, but it’s availing of existing infrastructure, costs a lot less to the end user, and is far less energy-intensive per passenger mile. Regarding your suggestion that electrical lines will become less carbon-intensive over time… I agree that’s a possibility; but it’s not guaranteed. I’m pretty concerned that western governments are going to return to coal in a big way and stick up two fingers to Climate Change. It’ll be disastrous if they do, but you can always trust mainstream politicians to take the path of least resistance even if it’s a suicidal policy in the long-term. They’re just not very smart, y’know. All the same, I would like to see an expansion of conventional rail and more money being put into electrification (I know some investment is going that direction, but that 32 / 17 / whatever billion could significantly accelerate the process). At least then the system wouldn’t be reliant upon dwindling liquid fuel reserves and would have the possibility of running on renewable energy sources. Again, I wasn’t aware the HS2 trains are scheduled to be double-decker, high-capacity jobs. Once more I must blame a misleading TV news report for my error, though that’s no excuse (I should have confirmed it). This might make them slightly more energy efficient per passenger mile, but probably not a huge amount (bigger trains are heavier… more passengers increase weight carried, and the higher the speed the more these factors influence energy consumption; but yes, double-decker trains would be better than single-decker ones). Like the coach issue, though, I disagree with your claim that existing line capacities can’t be increased. Given the amount of money being spent on HS2, I’d be shocked if an updated / alternative signalling system could not be implemented to allow longer trains to run on existing infrastructure, for a fraction of that cost. I don’t have the unlimited faith in human ingenuity than many people seem to possess, but I’d lay odds on it being within our power to upgrade the current lines to handle longer and more frequent trains. When all’s said and done, you do put up a good argument in favour of HS2. I was taken in by some apparent inaccuracies on the TV, and misread an article on the subject. HOWEVER, that doesn’t affect my primary objection (all other objections are really just filler material in the hope of making the primary one more convincing ?? And that objection is, simply put, that we need to radically reduce our energy consumption. By 2026 less of us will be travelling (making capacity constraints less of an issue), and the distances we travel will be shorter. Transportation of all kinds will be more expensive (indeed air travel will once again be the preserve of the genuinely wealthy) and in that environment it makes more sense to have invested in the most energy-efficient modes of transport possible (coaches and conventional rail being the obvious candidates). If the world of 2026 turns out to be how you envision it (i.e. the massive energy crisis I claim is at our doorstep doesn’t materialise) then you’ve convinced me that HS2 might well be (or have been) a worthwhile investment. But as you well know, that’s not the 2026 that I envision. So HS2 will turn out to have been a disastrous waste of money that could have been far better spent on infrastructure projects that actually prepared Britain for the reality of resource depletion. The view in your last two paragraphs is one which needs to be spread more widely (as I know you know!). The mainstream debate on sustainability is currently based on “lunatics in total denial” versus “people who hold approximately my view”; it should be “people who hold approximately my view” versus “people who hold approximately your view”. The reason I became so irate over the HS2 thing was because people were outright lying (and many more taking the lies at face value) that the scheme failed from a moderate-emissions-cutting-based-on-regulated-markets perspective, whereas in fact it’s been carefully designed based on rigorous testing of alternative options to beat the plans thrown around by the likes of the Taxpayers’ Alliance. It succeeds on its own terms, although clearly it still fails if those premises are false. I’m more inclined to side with John, in this Jim vs John debate that’s been set up here. For one thing, travelling by coach is painful, and even faster, nicer coaches which take 2 hours to do London to Birmingham will be an alternative few would leap at, unless it is really very apparent that the world energy crisis is focring people to make that choice. So it seems like there’s agreement that HS2 will reduce emissions, but disagreement over whether it will reduce emissions ‘enough’ compared to alternatives. It’s a difficult and technical argument, and while the Green party, for example, say we should be spending the money on more trains and longer trains etc, I suspect in the medium term we will need both if we’re going to get people out of cars and planes. At the end of the day if you approach the question from a climate change point of view, there’s no getting around the need for tackling supply of fossil fuels as well as demand, e.g. with a global carbon cap of the type we all know is needed but which, well, ain’t happening. In the mean time I’m in the ‘faster trains – yes please’ camp. Hi, some really interesting points made. I think an alternate perspective is also available, alluded to by both John and Jim. Regardless of how desirable it may be, I don’t find predictions involving massive shifts from personal to mass transit in the next 20 years credible, as I don’t believe enough of us live in high enough population-density areas. Further to that price-inelasticity and the new resources Ryan mentioned, I think it’s no unreasonable to think there’s a great deal of scope for development in fuel efficiency (e.g. betting tipshttp://www.techthefuture.com/mobility/airbus-unveils-fuel-efficient-aircraft-of-the-future/ etc etc), plus the scope for development of crop-based fuels (half the world may starve, but hey). Just a quick response to a point made above by John B in #1. The idea that existing lines have reached full capacity and that trains cannot be lengthened appears to be contradicted by an engineering report commissioned by the government. The report suggests that it would be possible “to increase long-distance capacity on the west coast main line by lengthening the trains to 12 cars, reducing the number of first-class carriages and running additional peak long-distance services”. Not only would this be far less environmentally damaging, but would be more than two and half times as beneficial to Britain from an economic standpoint. Thanks for your comment Ryan. Needless to say though, I disagree with much of it. The basic thrust of my argument is that we need to be investing in energy-efficient infrastructure because we face an energy crisis. You “don’t see too many signs of this energy crisis arriving any time soon” and cite “tar sands, shale gas*, arctic oil etc” and their ‘economic viability’ in defence of that statement. Yes, we agree that HS2 will reduce emissions when compared with cars and planes. But it will increase emissions when compared with coaches and conventional rail (the capacity of which can almost certainly be significantly upgraded contrary to some claims). And that’s just per passenger mile. Crucially those emissions calculations don’t include reference to the carbon dioxide produced by the building of the infrastructure itself. With both conventional rail and the M1 (coaches) the infrastructure is already there (though the existing rail network needs upgrading and all three require ongoing maintenance). With HS2 however, you’re talking about a whole new line – and ultimately a whole new network. I’m unaware of any public numbers surrounding the emissions that will be produced by the large quantities of steel and concrete production (both carbon intensive processes) that will be required for HS2. But I’d put money on them being significant. Certainly significant enough to make the comparison with coach and conventional rail look even worse than it already does. Which is why, from a Climate Change perspective, given that there are alternatives that produce less emissions, and given that we could – using road tolls and air travel taxation (even leaving aside the ‘energy crisis’ issue which I don’t feel should be left aside, but just for a moment) – provide significant incentives to switch to those low[er]-emission alternatives; the phrase “faster trains – yes please” seems almost synonymous with “higher emissions – yes please”. It is an admission that speed and comfort (“travelling by coach is painful”) will remain a higher priority than acting in an ethical and responsible manner. And while that may be an accurate assessment of western values, I would argue that we should be trying to change those values rather than supporting a massive High Speed project that merely reinforces them. I would almost welcome peak oil and the energy crisis as a means to change our thinking on this matter. Except of course, it won’t do until it’s too late. Unless we change those values before the crisis hits us (and to me, that means within the next 3-8 years) then peak oil will be the straw that breaks the back of our attempts to combat climate change. So long as our society embraces “faster trains – yes please” thinking, it will attempt to offset peak oil in any way it can – and ultimately that will mean a return to coal and the last great deforestation. Because the saviours you propose; tar sands, shale gas and Arctic oil are illusions. And massively destructive ones at that. In the final analysis, the faster a train runs the more energy it consumes. And in a world running on fossil fuels that means the faster a train runs, the higher the emissions it produces (whether it is burning diesel or drawing electricity from a coal-burning power plant). So from my perspective, it’s most definitely “faster trains – no thanks”. With respect to your not finding it credible that a massive shift from personal to mass transport is imminent, it’s my contention that such a shift is essentially inevitable. Peak oil will make air travel much more exclusive but it will also significantly reduce routine car usage. That fuel efficient aircraft you linked to, for example, is optimistically expected to arrive in 2030. In my view this will put it 12-15 years too late to the party and the global airline industry will be unrecognisable by that point. There is no question that we will become more fuel efficient over the next couple of decades, but it simply won’t happen fast enough to come close to compensating for the rate of decline in liquid fuel availability. And yes, we will swiftly turn to extremely damaging (hell, near-suicidal) alternatives such as biofuels and coal-to-liquid. But once again, they cannot hope to mitigate the decline in conventional fuels. What we need to be doing is adopting crash positions. We need to be investing (and I mean right now, because we have little time left) in mitigation strategies, not building High Speed Rail Systems that will either gather dust or become – like regular commercial air travel – the domain of the very wealthy. And it’s worth pointing out that I’m not alone in this prediction. It is shared by such radical fringe organisations as the US Dept of Defence, the US Army, the International Energy Agency, the International Monetary Fund, GMO Capital and a whole host of others. That this isn’t front page news most days of the week is really the only mystery left to solve. A final point about HS2. I don’t actually think it will happen precisely because it is not due to begin construction for several years by which point resource depletion will have loomed fully into view. So my biggest problem with it is that the promise of HS2 will prevent us from investing in more sensible alternatives.